Judith Brett’s latest offering, hot on the heels of her bestselling (and award-winning) biography of Alfred Deakin, is a tightly written history of Australia’s electoral system. Moreover, it reads like a thriller. Some would argue that our electoral system isn’t perfect, but it’s pretty damn good: we all turn out on a Saturday, queue for a bit, vote, then eat our democracy sausages (or cakes). And then in the evening, if you’re anything like me, you get out the cheese and wine and settle down to watch the count. The majoritarian nature of the system ensures that all votes are utilised, capturing the views and preferences of minority groups in society, unlike in the UK where first-past-the-post is used. The voting, the counting, the individual booths, the chosen day, and even the pencils have a backstory. Something I didn’t know until reading this book is that the booths themselves (now heavy-duty cardboard) are a uniquely Australian invention! 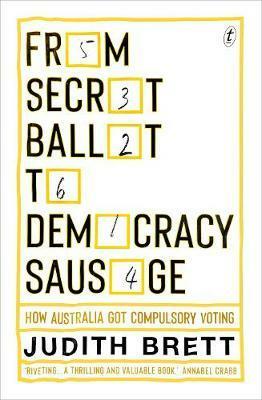 Brett’s thematic chapters explore the key innovations such as how we administer our elections and the creation of our preferential voting system, showing that the evolution of these systems was far from smooth. She also delves into the heated issues and debates around women’s suffrage, Indigenous disenfranchisement, and compulsory voting; illuminating key figures along the way. The chapter giving an account of the debate over the Franchise Act which, when passed, resulted in the disenfranchisement of First Australians, left me appalled and ashamed. Those supportive of Indigenous enfranchisement rationally argued that suffrage should extend naturally from the original and traditional custodianship of the continent. Peppered with fascinating facts such as the early name for the Liberal Party when it was originally formed (The Fusion Party – sounding every bit like a ’90s boy-band! ), this is a fantastic read for an election year!